2 What is RV water pump ? What is RV water pump ? We have a lot to talk about RV water pump. But first things first, let’s take a closer look at RV water system. Every RV has a clean and waste water system. The clean system provides potable water; the other holds waste water named as black and gray water. Black water comes from toilet. And the latter from sinks and the shower. RVs store their water in built-in tanks, which are usually located in the base of the motorhome or trailer. An average RV tank can store from 50 gallons up to 200 gallons of fresh water. Your unit has three types of tanks: the fresh water, gray (or used) water, and black (or waste) water tank. Back to your situation above, you need a tool to take the water from your RV’s tank up the pipe system of the rig: the RV Water Pump ! Uplifting the flow of the water as well as stabilizing the pressure is its function. A pump helps you to get water from the kitchen and bathroom faucets, keeping the shower and toilet flowing. In brief, the RV water pump provide you with the fresh water from the tank. However you should notice that most RV water pumps are small in size and they run off the RV’s battery. Standard operating motors designed specifically for RV use. Usually found on buses and trucks. Mostly used for heavy jobs. Note: Regular maintenance is required to ensure outstanding performance and longer lifespan. RV Awnings is a feature that keeps rain away from your RV windows. Have you ever thought what a tarpaulin looks like after a few months out in the sun? Yes, your RV awning needs cleaning, how to clean RV awnings? It’s time for you to make a decision. These vital factors below can help you pick out the most appropriate RV Water Pump. The best way for you to understand RV water pumps is to check its specifications. You also have to look for the amount of water it can pump in a minute. An ideal RV water pump can pump about three gallons of water every minute. Majority of water pumps come with 12 volts unlike the ones found in buses and trucks. Remember that a fuse must be placed in the wiring before the device. It is recommended that a twin wire up be run instead of using chassis. The noise is somehow correlative to the type and power the water pump can provide. It is advisable to seal off the pump with a cover if you want to lessen the noise. The cover can also protect the pump from muffle and other elements. One thing to note, the pump must be covered enough to let air in and would not cause overheating. Some models presented above feature auto switch, which can be very convenient to the user. Rating of pressure should also be considered to know how many gallons of water the pump could accommodate. It is very important to remember that pumps require energy when the tap is on. This would mean that the more power the water pump has, the more energy it has. The cycle occurs whenever the pump is tapped off and on few times while being used in the bathroom. This is normally caused by the rate of the pump exceeding your water usage. One thing to remember, the pump should automatically stop when there is a pressure drop. If it goes below the preset value, the pump should automatically be reactivated. Finally, you should also take into consideration your budget. Make sure the quality and features align with its price so you can prevent making an expensive mistake. This part is shown for the purpose of visualizing RV Water Pump more easily. Let’s check it ! RV Water Pump may have been in your mind now. But, wait! We want to cover everything for you again. Firstly, you know what it is. 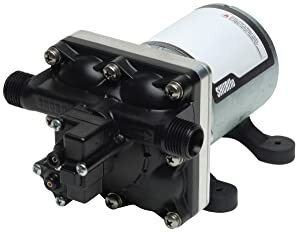 Secondly, it is pretty clear to be familiar with two common types of the water pump: 12V and 24V. At last but not least, 7 key points provide some advice that can guide you to buy the best for yourself. we already mention pros and cons. Now ball is in your court, just think carefully to find your true RV Water Pump!